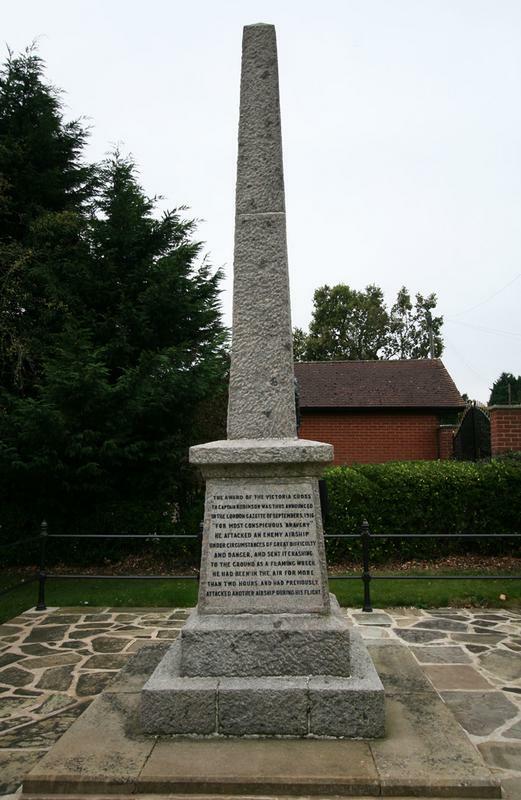 Obelisk set on a tapering plinth, a base and paved area. 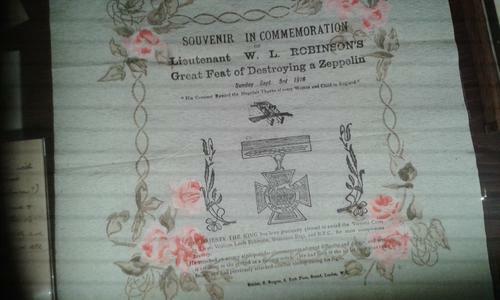 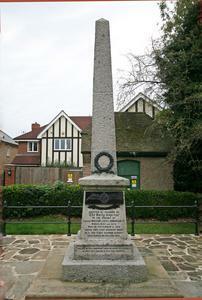 There is a cast wreath at the base of the obelisk and a plaque with an RFC wings and swags. 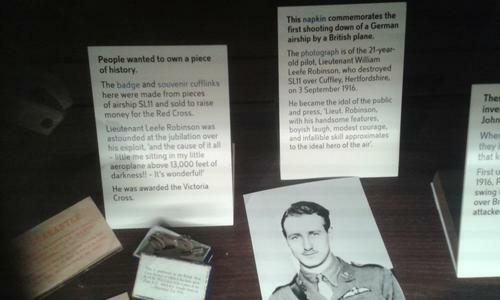 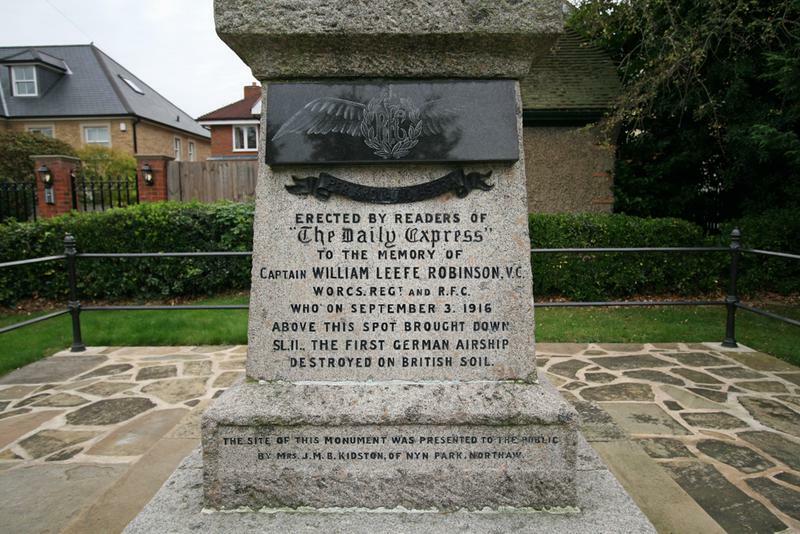 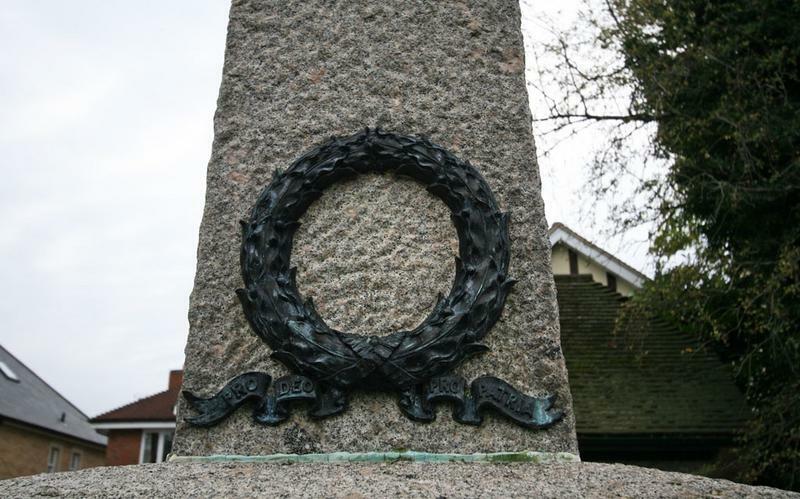 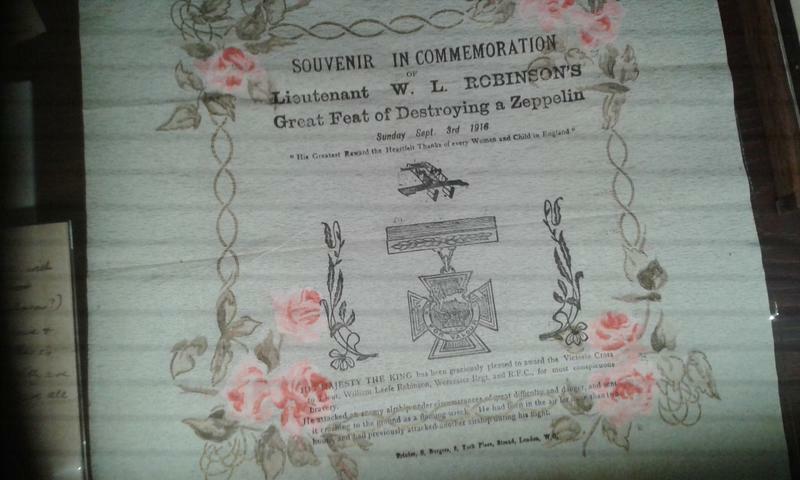 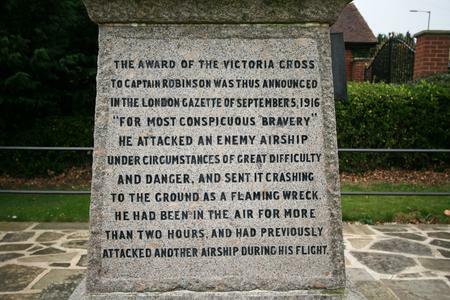 (Front face)ERECTED BY READERS OF/ "THE DAILY EXPRESS" TO THE MEMORY OF CAPTAIN WILLIAM LEEFE ROBINSON VC,/ WORCS. 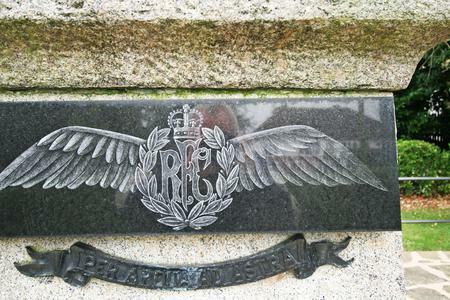 REGT AND R.F.C. WHO ON SEPTEMBER 3 1916/ ABOVE THIS SPOT BROUGHT DOWN/ SL11, THE FIRST GERMAN AIRSHIP/ DESTROYED ON BRITISH SOIL./ THE SITE OF THIS MONUMENT WAS PRESENTED TO THE PUBLIC/ BY MRS J.M.B. 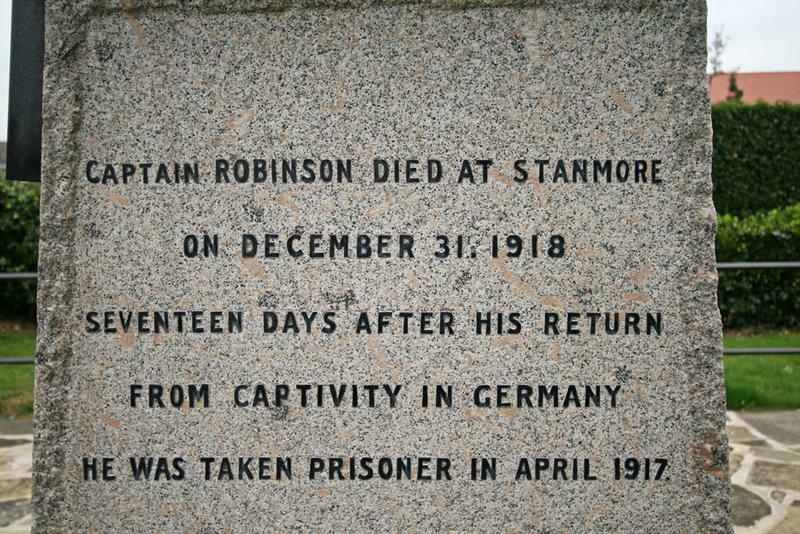 KIDSTON, OF NYM PARK, NORTHAW. (Right face) CAPTAIN ROBINSON DIED AT STANMORE/ ON DECEMBER 31, 1918/ SEVENTEEN DAYS AFTER HIS RETURN / FROM CAPTIVITY IN GERMANY/ HE WAS TAKEN PRISONER IN APRIL 1917 (Left face)THE AWARD OF THE VICTORIA CROSS/ TO CAPTAIN ROBINSON WAS THUS ANNOUNCED/ IN THE LONDON GAZETTE OF SEPTEMBER 5, 1916/" FOR MOST CONSPICUOUS BRAVERY"/ HE ATTACKED AN ENEMY AIRSHIP/ UNDER CIRCUMSTANCES OF GREAT DIFFICULTY/ AND DANGER, AND SENT IT CRASHING/ TO THE GROUND AS A FLAMING WRECK./ HE HAD BEEN IN THE AIR FOR MORE/ THAN TWO HOURS, AND HAD PREVIOUSLY/ ATTACKED ANOTHER AIRSHIP DURING HIS FLIGHT"
Flight 16 June 1921 p.404 Report of unveiling by Capt F E Guest, Secretary of State for Air.